The sons of Niall of the Nine Hostages, Eoghan, Conall [Gulban], and Enda, travelled north from the kingdom of Connacht into the western and northern regions of the kingdom of Ulster (county Donegal). It was here in the 5th century that the Cenél Eóghain and Cenél Conaill began to establish themselves as overlords in northwestern Ulster. The Cenél Eóghain established their power base at Inishowen and their capital at Aileach. The Cenél Conaill centered themselves around the rich area of Magh Ithe, in the valley of the river Finn. The two clans alternated as kings of the North up to the 8th century. The Northern Ui Neill also alternated with their southern cousins as so-called 'sovereigns of Ireland' into the 10th century. In the 8th century a series of victories were gained by the Cenél Eóghain over the Cenél Conaill in Magh Ithe (east Co. Donegal), splitting their power between the territories of Fanad, in the north, and Tir nAeda, in the south. By the beginning of the 9th century the Cenél Eóghain were the dominant Northern dynasty, as they spread their influence east into modern county Derry, pushing aside the Cruithin east of the river Bann, gaining control over the Ciannachta of mid-Derry, and steadily encroaching on the Airgiallan tribes of Ui Macc Uais. The dominance of the Cenél Eóghain continued as they drove further south, subjugating other Airghiallan tribes, and by the 11th century the Cenél Eóghain had moved their power base from Aileach to that near Tullahogue in modern day county Tyrone (named from Tir Eóghain, or Tir Owen). By the 12th century much of the area of Magh Ithe, and later that of Inishowen, was taken by the O'Donnells and O'Dohertys of Cenél Conaill. By the mid 13th century a leading family of the Cenél Eóghain, the Mac Lochlainn (McLoughlin), began to lose prominence to their kinsmen, the Ó Neill. There are many notable northern Uí Neill clans which included O'Neill, O'Donnell, MacLoughlin, O'Donnelly, O'Doherty, O'Cannon, O'Muldory, O'Kane, O'Gallagher, O'Gormley, O’Flaherty or O’Laverty, O'Hamill, O'Lunney, O'Carolan of Clan Diarmada, O'Quin, O'Hagan of Tullahogue, O'Devlin of Munterdevlin, among many others. 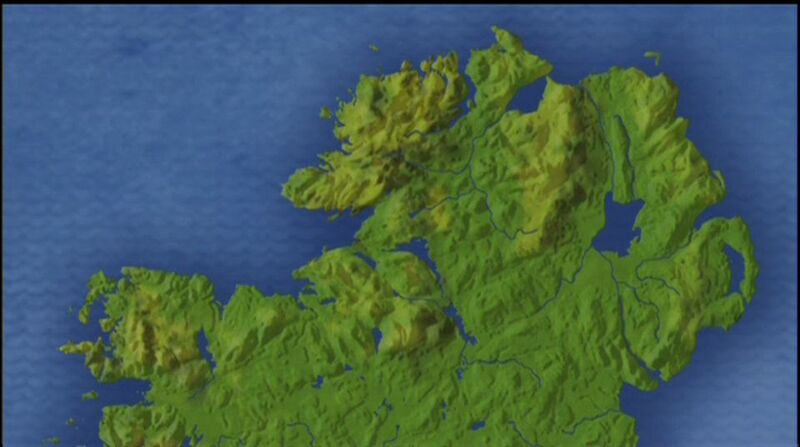 Click here for a Physical Map of the Ulster region. Eoghan was the son of Niall who established his kingdom in Innishowen, centered at Aileach. Eoghan's sons included Muiredach, Binech, Fergus, Óengus, Dallán, Cormac, Feideilmid, Ailill, Echen, Illann, and Eochaid. Some of the clans of the Cenél Eóghain included those of Clan Neill, Clan Domnaill, Clan Birn, Cenél Fergusa, Cairrge Brachaidhe, Cenél Binnigh, Cenél Moen, Cenél Fearadhaigh, Cenel Tigernaich, Clan Conchobhair, Clan Diarmatta. For 527, After Muircheartach, son of Muireadhach, son of Eoghan, son of Niall of the Nine Hostages, had been twenty four years in the sovereignty of Ireland, he was burned in the house of Cleiteach, over the Boyne, on the night of Samhain the first of November, after being drowned in wine. For 557, The battle of Moin Doire Lothair was gained over the Cruithnigh, by the Uí Neill of the North, i. e. by the Cinel Conaill and Cinel Eoghain, wherein fell seven chieftains of the Cruithnigh, together with Aedh Breac; and it was on this occasion that the Lee and Carn Eolairg were forfeited to the Clanna Neill of the North. For 561, After Domhnall and Fearghus, the two sons of Muircheartach, son of Muireadhach, son of Eoghan, son of Niall, had been three years in the sovereignty of Ireland, they both died. For 562, Eochaidh, son of Domhnall, son of Muircheartach, and of Baedan, son of Muircheartach, son of Muireadhach, had been two years in the sovereignty of Ireland, they were slain by Cronan, chief of Cianachta Glinne Gemhin. For 601, The first year of Aedh Uairidhnach, son of Domhnall Ilchealgach, son of Muircheartach, son of Muireadhach, son of Eoghan, in the sovereignty of Ireland. For 634, The battle of Saeltire was gained by Conall Cael, son of Maelcobha, over the Cinel Eoghain. For 650, The battle of Fleascach, by Crunnmael, son of Suibhne, chief of Cinel Eoghain, in which was slain Cumascach, son of Oilioll, chief of Uí Cremhthainn. For 679, Dunghal, son of Scannal, chief of the Cruithni, and Ceannfaeladh, son of Suibhne, chief of Cianachta Glinne Geimhin, were burned by Maelduin, son of Maelfithrigh, at Dun Ceithirn. For 698, Flann, son of Ceannfaeladh, son of Suibhne, chief of Cinel Eoghain, was slain. For 698, Aurthuile Ua Crunnmaeil, chief of Cinel Eoghain was driven from his chieftainry into Britain. For 698, Flann Finn, son of Maeltuile Ua Crunnmaeil, chief of Cinel Eoghain, died. For 705, The battle of Leathairbhe was gained by Congal, son of Fearghus Fanad (sovereign of Ireland), over the Cinel Eoghain, where Maelduin, son of Maelfithrigh, Lord of the Cinel Eoghain, was slain. For 718, After Fearghal, son of Maelduin, son of Maelfithrigh, had been ten years in sovereignty over Ireland, he was slain in the battle of Almhain. Also fell Forbasach, chief of Cinel Boghaine; Conall Menn, chief of Cinel Cairbre. For 721, The battle of Druim Fornocht was fought by Flaithbheartach, son of Loingseach, and the Cinel Conaill, against Aedh Allan, son of Fearghal, and the Cinel Eoghain. Aedh Allan was defeated. These chieftains were slain on the side of Aedh, namely Flann, son of Erthaile, and Snedgus Dearg Ua Brachaidhe. For 727, A battle was fought between Aedh, son of Fearghal, and the Cinel Conaill, at Magh Itha, where Conaing, son of Congal, son of Fearghus, and many others of the Cinel Eoghain, were slain. For 728, A battle was fought in Magh Itha, between the sons of Loingseach, son of Aenghus, and the sons of Fearghal, son of Maelduin, where numbers of the Cinel Eoghain were slain, and Conchadh, son of Cuanach, chief of Cobha, was also slain. For 730, The first year of Aedh Allan, son of Fearghal, son of Maelduin, over Ireland. For 732, The battle of Fochart, in Magh Muirtheimhne was fought by Aedh Allan and the Clanna Neill of the North, against the Ulidians, where Aedh Roin, King of Ulidia, was slain. For 733, Aedh Allan, King of Ireland, assembled the forces of Leath Chuinn, to proceed into Leinster; and he arrived at Ath Seanaith. The Leinstermen collected the greatest number they were able, to defend his right against him. A fierce battle was fought between them. The king, Aedh Allan himself; went into the battle, and the chieftains of the North along with him. The chieftains of Leinster came with their kings into the battle; and bloodily and heroically was the battle fought between them both. Heroes were slaughtered, and bodies were mutilated. Aedh Allan, and Aedh, son of Colgan, King of Leinster, met each other in single combat; and Aedh, son of Colgan, was slain by Aedh Allan. The Leinstermen were killed, slaughtered, cut off, and dreadfully exterminated, in this battle, so that there escaped of them but a small remnant, and a few fugitives. For 738, Aedh Allan, son of Maelduin, fell in the battle of Magh Seirigh (i.e. Ceanannus), between the two Teabhthas, by Domhnall, son of Murchadh, after having been nine years in the sovereignty of Ireland. There were also slain in the same battle Cumascach, son of Conchubhar, Lord of the Airtheara (the Oriors); Maenach, son of Connalach, Lord of Uí Creamhthainn; and Muireadhach, son of Fearghus Forcraidh, Lord of Uí Tuirtre. For 751, The army of Leinster was led by Domhnall, son of Murchadh, of Clan Cholmain, against Niall i.e. the Uí Neill, until they arrived in Magh Muirtheimhne. For 754, The battle of Eamhain Macha was gained by Fiachna, son of Aedh Roin (king of Uladh), over the Uí Neill, wherein were slain Dunghal Ua Conaing and Donnbo. For 765, Niall Frosach, son of Fearghal, was seven years king over Ireland when he resigned; and he died at I Coluim Cille, on his pilgrimage eight years afterwards. For 766, There arose a dissention between Ceallach, son of Donnchadh, King of Leinster, and the monarch Donnchadh, son of Domhnall. Donnchadh made a full muster of the Uí Neill and marched into Leinster. The Leinstermen moved before the monarch and his forces until they arrived at Sciath Neachtain. Donnchadh, with his forces, remained at Aillinn; his people continued to fire, burn, plunder, and devastate the province for the space of a week, when the Leinstermen at length submitted to his will. For 774, A hosting was made by Donnchadh, son of Domhnall (southern Uí Neill sovereign of Ireland), into the North, so that he brought hostages from Domhnall, son of Aedh Muindearg, lord of the North. For 782, A battle (i.e. the battle of Ircoir) between the Cinel Conaill and Cinel Eoghain, in which Domhnall, son of Aedh Muindearg, was routed. For 783, Maelduin, son of Aedh Allan, King of the North, died. For 784, The battle of Claideach, between the Cinel Eoghain and Cinel Conaill, in which Domhnall was routed. For 793, The first year of Aedh Oirdnidhe, son of Niall Frosach, in sovereignty over Ireland. For 797, Aedh Oirdnidhe went to Meath, and divided Meath between the two sons of Donnchadh, namely, Conchubhar and Ailill. For 799, Aedh Oirdnidhe assembled a very great army to proceed into Leinster and devastated Leinster twice in one month. Aedh Oirdnidhe afterwards went to the King of Leinster, and obtained his full demand from the Leinstermen; and Finsneachta, King of Leinster, gave him hostages and pledges. For 800, Aedh Oirdnidhe went to Dun Cuair, and divided Leinster between the two Muireadhachs, namely, Muireadhach, son of Ruadhrach, and Muireadhach, son of Bran. For 815, Aedh Oirdnidhe went a second time with a very great army to Dun Cuar, and divided Leinster between the two grandsons of Bran. For 817, A battle between the Cinel Conaill and Cinel Eoghain, in which Maelbreasail, son of Murchadh, lord of Cinel Conaill, was slain by Murchadh, son of Maelduin. Niall Caille mustered his forces, namely, the races of Conall and Eoghan; and Cumusgach, lord of Airghialla, and Muireadhach, son of Eochadh, lord of Uí Eathach Uladh, mustered the Airghialla and the Ulidians; and a spirited battle was fought between them, i. e. the battle of Leithi Cam, in Magh Enir. Victory was gained over the troops of Aileach, by the Airghialla, on the two first days; but on the third day, when Niall himself came into the battle at Leithi Luin, in the vicinity of Leithi Cam, the Airghialla were defeated, cut down, and pursued to Craebh Caille, over the Callainn, to the west of Ard Macha; and the battle was gained over the Ulidians and Airghialla, and a slaughter made of them. For 821, The deposing of Murchadh, son of Maelduin, by Niall Caille, son of Aedh Oirdnidhe, and by the Cinel Eoghain. For 825, The violation of Eoghan Mainistreach, as to the primacy of Ard Macha; for Cumasgach, son of Cathal, lord of Airghialla, forcibly drove him from it, and set up Airtri, son of Conchobhar (half brother of Cumasgach by the mother), in his place. For 864, A complete muster of the North was made by Aedh Finnliath, so that he plundered the fortresses of the foreigners, wherever they were in the North, both in Cinel Eoghain and Dal Araidhe. For 879, A hosting was made by the king, Flann, son of Maelseachlainn, with the Irishand foreigners, into the North; and they halted at Magh Eitir Di Glais, so that Ard Macha was plundered by some of the troops; and he took the hostages of the Cinel Conaill and Cinel Eoghain on that expedition. For 896, Maelbreasail, son of Maeldoraidh, lord of Cinel Conaill, was slain in the battle of Sailtin, by Murchadh, son of Maelduin, lord of Cinel Eoghain. For 1003, Aodh, mac Domhnaill uí Néill, tighearna Oiligh. For 1148, Domhnall Ua Gairmledhaigh, tigherna Chenel Eoghain. For 1164, Muirchertach, mac Néill, rí Ailigh & maithe Cenel Eoghain. For 1177, Aedh h-Ua Neill .i., In Macamh Toinlesc, ri Ceneoil Eogain. For 1197, Flaithbertach O Mael Doraidh .i., ri Conaill & Eogain & Aigiall. Clan Neill, included the dominant Cenél Eóghain septs of Ó Neill and Mac Lochlainn, as well as many other notable septs. The name O'Neill is said to originate with Niall Glúndub, a 10th century ancestor of the Uí Neill line. The reference here to Clan Neill refers to Neill Caille, his grandfather. Ó Neill and Mac Lochlainn are anciently cited as kings of Aileach, a base of power at the lower end of the Inishowen peninsula. By the 11th century the Ó Neill had established a seat of power at Tullahogue, co. Tyrone, and later became the dominant sept of the Cenél Eóghain. Domnall m. Ardgair m. Lochlaind m. Muiredaich m. Domnaill m. Muirchertaich m. Néill Glúnduib m. Áeda Findléith m. Néill Caille m. Áeda Oirdnide m. Néill Frossaich m. Fergaile m. Máele Dúin m. Máel Fithrich m. Áeda Uaridnaich m. Domnaill m. Muircherdaich m. Muiredaich m. Éogain m. Néill. Eoghan m Neill oicc m. Neill moir m. Aedha m. Domhnaill m. Briain catha duinn m. Neill ruaidh m. Aeda m. Muircertaigh muighe lugaidh m. Taidhg glinne m. Conchobair na fiodhbaide m. Flaithbertaigh locha h-adair m. Domhnaill m. Aedha athlamhain m. Flaithbertaigh an trostain m. Muircertaigh mhidhigh m. Domhnaill arda macha m. Muircertaigh na ccocal ccroicenn m. Neill glunduibh m. Aedha finnleith m. Neill caille m. Aedha oirdnide m. Neill frosaigh m. Ferghail m. Maile duin m. Maile fithrigh m. Aedha uairidhnigh m. Domhnaill ilcealccaigh m. Muircertaigh m. Muiredaigh m. Eoghain m. Neill naighiallaigh. Clan Domnaill, of Cenél Eóghain. The name of O'Donnelly is said to derive from a great-great grandson of Domnaill, that is Donghaile. They were cited as chiefs of Feardroma, perhaps near Ballydonnelly, in county Tyrone. There is also a Fer Droma Lighen, a name remembered in the townland of Drumleene, Clonleig parish, barony of Raphoe, county Donegal. Of the same region, the sept of Cenél n-Echach Droma Lighen are cited in the Book of Ballymote and the Book of Lecan, descended from Eocho, son of Domhnall, son of Muirceartach Mac Earca. The O'Donnellys are later cited at Castlecaulfield, alias Ballydonnelly (Baile Ui Donngaile), near Dungannon, in co. Tyrone. The name Ua [F]laithbertaigh is associated as a king of Clann-Domhnaill in the Annals. Note: Not to be confused with Flaithbertaigh, king of West Connacht. Áed m. Néill m. Máel Sechnaill m. Máel Ruanaid m. Flaind m. Domnaill m. Áeda Findléith m. Néill Caille m. Áeda Oirdnide m. Néill Frossaich m. Fergaile m. Máele Dúin m. Máel Fithrich m. Áeda Uaridnaich m. Domnaill m. Muircherdaich m. Muiredaich m. Éogain m. Néill Noígiallaig. Gilla Meic Liac m. Echthigirn m. Donngaile m. Cellacháin m. Domailén m. Donngaile m. Sechnassaich m. Cellaich m. Echdach m. Domnaill m. Áeda Findléith m. Néill Caille m. Áeda Oirdnide. LC1123, Conghalach Ua Laithbhertaigh royal heir of Oilech, occisus est. U1178, Domnall Ua Gailmredhaigh was deposed and Cenel-Maien gave the chieftainship to Ruaidhri Ua [F]laithbertaigh. U1183, A contest [took place] between the Gilla-riabhach Ua Flaithbertaigh and the son of Ua Gailmredhaigh and O [F]laithbertaigh was killed there and a party of the Cenel-Moien was killed there. LC1186, Dethronement of Domhnall, son of Aedh Mac Lachlainn, and installation as king of Ruaidhri O'Laithbhertaigh, by a section of the Cenel-Eoghain of Telach-óg. U1188 Ua Gairb (namely, Maghnus), chief of Fir-Droma, who laid [violent] hands on Ua Cananna[i]n, was killed by the people of Echmarcach Ua Dochartaigh in revenge of Ua Cananna[i]n.
LC1216, Mathghamhain O'Laithbhertaigh, king of Clann-Domhnaill, died. U1251, Ardghal Ua [F]laithbertaigh royal heir of Ailech, candle of the championship and hospitality of the North of Ireland, died. Clan Birn, descended from Bern, son of Ruadrí, son of Murchad, a quo Muinter Birn, in the line of Cenél Eóghain, according to the genealogies in Rawlinson B502. In addition Rawlinson points to a son of Bern named Anféid, a quo Tellach n-Anfida, who was possibly the namesake for Tellach Ainbhith. According to O'Dugan (Topograhipcal Poems), the MacRuaidhris were among those over Teallach Ainbhith and over Muintir-Birn. O'Hart (Pedigrees) cites the name MacRuaidhri as MacRory or MacRogers, over the same territories, districts which he places in the baronies of Dungannon and Strabane, county Tyrone. Woulfe (Irish Names) agrees and also cites the family of MacRuaidhri as erenaghs of Ballynascreen, in County Derry. O'Hart goes on to cite, under the county Armagh, Muintir Birn, some of whose descendants anglicized their name Bruen, was a district in the south of the barony of Dungannon, adjoining the territory of Trough in county Monaghan. In Murphy surname history, there is mention of the surname Mac Murchadha (MacMurphy, Murphy), originally based in present-day Co. Tyrone, in the area known as Muintir Birn, but were driven out by the O'Neills and settled in south Armagh. The reference seems corroborated in various entries in the Annals, although the name Mac Murrough seems to be applied there, which may have later been translated into MacMorrow or MacMurray. In Colgan's Trias Thaumaturga, it mentions Ui Briuin, now Muinter Birn, alias Ui Briuinia Aquilonaris, in county Tír Eoguin, and diocese of Ardmache. This is an apparent reference to Ua mBriúin Archaille in Ui Chremthaind, a branch of Siol Colla dá Chrich, who were also noted in the Dungannon area. Note: Not to be confused with Muintir Birn, O'Beirne of Ui Briúin na Sinna, in county Roscommon. Cú Lacha m. Con Chaille m. Muredaich m. Fergail m. Muiredaich m. Birnn m. Ruadrach m. Murchada m. Máel Dúin m. Áeda Alláin m. Fergaile m. Máel Dúin m. Máel Fithrich m. Áeda Uaridnaich m. Domnaill m. Muircherdaich m. Muiredaich m. Éogain m. Néill Noígiallaig. U1120, Conchobor son of Flannacán son of Donnchuan, chief of Muinter Birn, was wounded in Sliab Fuait by the Uí Chremthainn, and died of it. U1166, Diarmait Mac Murchadha, chief of Muinnter-Birn, was slain by his kinsmen. M1172, Mulmurry Mac Murrough, Lord of Muintir Birn, was slain by Mugh Magennis and the Clann-Aodha of Ui Eathach Uladh. U1172, Mael-Muire Mac Murchadha, chief of Muinnter-Birn and chief and king of the Ui-Echach, was killed by Aedh Mac Oenghusa and by the Clann-Aedha of the Ui-Echach of Ulidia. U1181, Aedh Mac Murchadha, royal chief of Muinnter-Birn and the Airthir and the Cantred, was killed by Mac Mathgamna in treachery, at a meeting. U1257, Mael-Muire Mac Murchaidh, chief of Muinnter-Birn, was killed, namely, by his own kinsman, at Cell-issel. Cenél Fergusa, of the Cenél Eóghain, with territory later held south of the Sperrin Mountains in Derry. Fergus was a son of Eoghan, and ancestor of the O'Hagans, O'Quins, Ua Mael Fhabaill (Mulfoyle, et al) and O'Mallons (O'Mellans) among others. Ua hOgain (O'Hagan) and O'Maelfhabhuill are cited as chiefs of Cinel-Fearghusa in the Annals. Ua Mael Fhabaill is also noted as chiefs of Cairrge Brachaidhe, cited in the northwest part of Inishowen. O'Mellan's country was said to be originally in southernmost Co. Derry, and the sept is later noted in Co. Tyrone. Ragnall mc Gillai Áeda m. Flaind m. Gillai Epscoip Éogain m. Ócáin m. Cináeda m. Máelgairb m. Ailella m. Cummascaich m. Donngaile m. Cuanach m. Conaill m. Brachaidi m. Diarmata m. Feideilmid m. Cairpre m. Cóelbad m. Fergusa m. Éogain m. Néill Noígiallaig. M1122, Donnsleibhe Ua hOgain, chief of Cinel-Fearghusa, and lawgiver of Tealach-Og, died. LC1215, Trad O'Maelfhabhuill, chieftain of Cenel-Ferghusa, with a great slaughter of his brethren along with him, was killed by Muiredhach, son of the Great Steward of Lemhain. Cairrge Brachaidhe. Perhaps named from Brachaidi mac Diarmata (or he named from it), the Cenél Fergusa held this territory at an early date. The Book of Lecan cites Diarmait, of Cenél Fergusa, rí Cairrce Brachaide. The sept of Ua Mael Fhabaill (Mulfaal, Mulfavil, MacFael or Mac Paul) are cited in the Annals as chiefs of Carrichbrack (Carrickbraghy) in the barony of Inishowen West, County Donegal. The Mulfaal sept claim descent from Fergus, grandson of Niall of the Nine Hostages, and are thus part of the Cenél Fergusa. O'Hogain (O'Hagan or Hogan) is cited as a chief in this region by O'Dugan (Poems). For For 721, Snedgus Dearg Ua Brachaidhe, was slain in battle on the side of Aedh Allan, son of Fearghal, and the Cinel Eoghain. For 834, Fearghus son of Badhbhchadh, lord of Carraig (Cairge or Cairrge) Brach Aidhe, was slain by the Munstermen. For 857, Seghonnán, son of Conang, lord of Carraig Brachaidhe, died. For 859, Sechonnan filius Conaing, rex Cairgi Brachaide, died. Fir 878/81, Maelfabhaill, son of Loingseach, lord of Carraig Brachaighe (or Chairrge Brachaighe), died. For 907, Ruarc, mac Maol Fabhaill, tighearna Cairrge Brachaidhe, died. For 965/67, Tigernach mac Ruairc, ri Carce Brachaidhe, died. For 1014, Cú Dubh, mac Maol Fabhaill, toiseach Cairrge Brachaighe was slain by the Síl Taidhg i m-Breghaibh. For 1053, Flaithbhertach Ua Mael Fabhaill, tigherna Cairrcce Brachaidhe, died. For 1065, Muircertach Ua Mael Fhabaill ri Cairce Brachaidhe was slain by the Ui Meithe Menna Tire. For 1082, Gilla Crist Ua Mael Fhabaill ri Cairrce Brachaidhe, died. For 1102, Sitricc Ua Maol Fabhaill tigherna Cairrge Brachaidhe. For 1166, Aedh Ua Mael Fhabhaill, tigherna Cairrcce Brachaidhe, was slain by the son of Néll Uí Lochlainn. M1198, Cathalan O'Mulfavil, Lord of Carrick-Braghy, was slain by O'Dearan, who was himself slain immediately afterwards in revenge of him. For 1199, Cathalan h-Ua Mael Fhabaill, ri Cairrgi Brachaidhe, was slain by d'O Deran. An Bredach, the territory of an Breadach (the Bredach, na Brétcha, na Brédcha, or Brédaigh) comprising the parishes of Upper and Lower Moville, barony of Inishowen West, county Donegal, and held by the sept of O Duibh Dhíorma (e.g. O'Duvdirma, O'Dierma, Dermond, or MacDermott of Bredagh Glen), a branch of Cinel Eoghain. An Ua Duibhdirma is cited also as king of Fordruim in the Annals, perhaps Fordrum naer Greencastle in the parish of Lower Moville, barony of Inishowen, county Donegal. Note: Not to be confused with Bredagh in Tirawley, Co. Mayo, where O'Toghda was chief. Domnall m. Áeda m. Cuind m. Cathail m. Duib Dírma m. Cathmoga m. Ruarcáin m. Duib Dírna m. Bicín m. Cuangaile m. Immainich m. Condálaich m. Toimtig m. Findchraid m. Fínáin m. Cremthaind m. Feidelmid m. Éogain m. Néill. M1043, Gillamochonna Ua Duibhdhirma, died. LC1122, Aedh Ua Duibhdhirma, chief of the Bredach, and head of the hospitality of the North, and Domhnall his brother, mortui sunt. U1167, Muircertach, son of Lagmand Ua Duibhdirma, king of Fordruim, tower of principality of all the North of Ireland, was killed in treachery by Donnchadh Ua Duibdirma and by the Bretach in the centre of Maghbile and two sons of his were killed on the morrow and a son was blinded. For 1178, Conor, the son of Conallagh O'Loony, assumed the chieftainship of Kinel-Moen; and Donnell, the son of Donnell O'Gormly, was banished from Moy Ithe into Inishowen, to Donough O'Duibhdhiorma. For 1198, Hugh O'Neill and the Kinel-Owen went to the plain of Magh Ithe, and plundered the Kinel-Connell. From this place they drove off a vast number of cows, after killing (Niall) O'Duvdirma in a skirmish between the cavalry. LC1215, Donnchadh O'Duibhdirma, chieftain of the Bredach, died in the Dubh-recles of Colum-Cille (Penitentiary), in Doire. U1243, Aedh O'Duibhdirma, chief of the Bredach, died. For 1260, The battle of Druim-dearg, near Dun-da-leath-ghlas (Downpatrick) was fought by Brien O'Neill and Hugh O'Conor, against the English of the North of Ireland. In this battle many of the Irish chieftains were slain, including Conor O'Duvdirma, and his son Hugh. Cenél mBinnigh, of the Cenél Eóghain, descendants of Eochu Binnigh, son of Eoghan, included the O'Hamills, who advanced into Airghialla territory, northwest of Lough Neagh, as early as the 6th century. According to the Book of Ballymote, their branches included Cenél mBinnig Glinne (valley of Glenconkeine, barony of Loughinsholin, county Derry), Cenél mBindigh Locha Droichid (east of Magh Ith in Tirone), and Cenél mBindigh Tuaithe Rois (east of the Foyle, in ancient Tirone). Several branches of the Cenél mBindigh Locha Droichid are noted, in th Index to the Four Masters, in the north of the barony of Loughinsholin, co. Derry. Garbíth m. Cináeda m. Gillai Cuimne m. Con Bethad m. Domnalláin m. Garbíth m. Uaréirge m. Máel Fábaill m. Daithgile m. Con Galann m. Elgonaich m. Cobraid m. Máel Dúin m. Faílbe m. Ultáin m. Domnaill m. Laisreáin m. Echach Binnich m. Éogain m. Néill Noígiallaig. For 1030, Mael Dúin, mac Ciarmhaic, tigherna Cheineoil m-Binnigh, was slain by Conchobhar ua Loingsigh. M1053, A depredation was committed by Mac Lochlainn and the men of Magh-Itha upon the Cinel-Binnigh, of Loch-Drochait; and they carried off three hundred cows. M1068, Flaithbheartach Ua Fearghail, lord of Tealach Og, was mortally wounded by the Cinel-Binnigh. U1075, Cinaed grandson of Cú Bethad, chief of Cenél Binnigh, died. U1078, Conchobor ua Briain, king of Telach Óc and heir-designate of Ireland, was killed, with his wife, by the Cenél Binnigh of Glenn. For 1078, Conchobhar Ua Briain, tigherna Ceneóil n-Eoghain & Tealcha Occ was slain by the Cenel m-Bindigh Glinne. M1081, Maelmithidh Ua Maelruanaidh, lord of Ui-Tuirtre, was slain by the Cinel-Binnigh of the valley (of Glenn). For 1081, Maol Mithidh Ua Maol Ruanaidh, tigherna Ua t-Tuirtre, do mharbhadh lá Cenél m-Binnigh Glinne. U1181, A great foray by the Men of Magh-Itha around O'Cathain, namely, Echmarcach and by the Cenel-Binnigh of the Glenn, until they went past Tuaim [on the Bann] and harried Fir-Li and Ui-Tuirtri and took away many thousands of cows. Cenél Moen, of the Cenél Eóghain, from Máién (Moen, Moain, or Múain), son of Muiredach and grandson of Eoghan. Originally of Tyrone?, and then Magh Itha in the barony of Raphoe, county Donegal, the Cenél Moen were driven across the Foyle by the O'Donnells to the northeast of Strabane in the 14th century. Moen was the great-grandson of Niall [of the Nine Hostages] whose descendants included Domnall O'Gairmleadhaigh (O'Gormley), king of Cenél Eóghain in the 12th century. Other surnames included O'Patton (Peyton) and O Luinigh (or O'Loony). For O'Gormley also see Fir Maige Itha. Conchobar m. Mail seclainn m. Sitrec m Concobair m. Neill m. Domhnaill m. Edalaigh m. Conchobhair m. Domhnaill m. Menman m. MicRaith m. Gairmleghaigh m. Cathmaoil m. Mail mithidh m. Dalbaigh m. Gairmlegaigh m. Ferdalaigh m. Tendalaigh m. Edalaigh m. Faelain m. Colmain m. Maein m. Muiredaigh m. Eogain m. Neill. M1090, Giolla Criost Ua Lúinigh, tigherna Cenél Moen, was killed by Domhnall O'Lochlainn. LC1119, Conchobhar O'Gairmleghaigh, chief of Cenel-Moain, was slain by the Uí-Dubhda, and by the Clann-Flaithbhertaigh. U1128, The men of Magh Itha, i.e. Domnall ua Gailmredhaigh, and the Cenél Moain stormed a house against the king of Fir Manach, i.e. Faelán ua Duibdara, and he fell by them, and a number of the nobles of the Fir Manach with him. CS1129, Magnus grandson of Lochlann, king of Cenél Eogain and the north, was killed by the Cenél Moain. LC1138, Maelruanaidh Ua Cairellain, kindling lamp of the north of Erinn as regards figure, understanding, and valour, was slain by the Cenel-Moain. M1160, Domhnall Ua Goirmleadhaigh, chief of Cinel-Moain, was slain by Maelruanaidh, lord of Feara-Manach, and the chiefs of Cinel-Moain along with him, through treachery and guile, at the instance of Muircheartach Ua Lochlainn. M1178, Conor, the son of Conallagh O'Loony, assumed the chieftainship of Kinel-Moen, but was afterwards deposed, and the Kinel-Moen gave back the chieftainship to Donnell, the son of Donnell O'Gormly. After the people of Donnell O'Gormly, namely, Gilla Caech O'Ederla, and the O'Flanagans, treacherously slew O'Loony in Donnell's own house, the Kinel-Moen drove Donnell O'Gormly from the chieftainship, and set up Rory O'Flaherty as their chieftain. LC1178, Domhnall O'Gairmleghaigh was deposed from being chief, and the Cenel-Moain gave the chieftainship to Ruaidhri O'Flaithbhertaigh. LC1178, Domhnall, son of Domhnall O'Gairmleghaigh was slain, in treachery, by the sons of O'Flaithbhertaigh and the other sons of Domhnall; and Tighernan, son of Raghnall, son of Domhnall, and eight full biatachs of the Cenel-Moain, were slain, along with them. M1179, A peace was concluded by Donough O'Carellan and all the Clandermot with the Kinel-Moen and O'Gormly, i.e. Auliffe, the son of Menman, brother-in-law of the aforesaid Donough. M1180, Raghnall h-Ua Cairellan was slain by the Cenel Moen. LC1183, A conflict between the Gilla-riabhach O'Flaithbhertaigh and the son of O'Gairmleghaigh; and O'Flaithbhertaigh was slain there, and a number of the Cenel-Moain were slain there. M1232, Conor, the son of Niall O'Gormly, Chief of Kinel-Moen, died. U1261, Niall Ua Gairmlegaidh, chief of Cenel-Moain, died. M1280, Melaghlin O'Gormly, Chief of Kinel-Moen, and Conor O'Gormly, fell by the tribe of Teallach-Modharain. C1281, Enna O Gairmlegaig, king-chieftain of the Cenel Moain, was killed. C1307, 1307, Maelsechlainn O Gairmlegaig, high-chieftain of the Cenel Moain, died. C1340, Maelsechlainn O Gormlegaig, chieftain of the Cenel Moain, died. Cenél Fearadhaigh, of the Cenél Eóghain, Feradach was the son of Muiredach, and great-grandson of Niall whose descendants included the MacCawells (MacCathmhaoil), as well as the Irish Campbells, of Cenél Fearadhaigh [Theas] in the Clogher area of Co. Tyrone. MacGilmartin were chiefs in the barony of Clogher, and one was chief of Cenel Fearadaigh in 1166. The Mac Fiachra sept of Cenél Fearadhaigh were known as MacKeaghery. MacFetridge was also cited as chief of Cineal Feradaigh (O'Hart Pedigees) in the north of Co. Tyrone where offshoots of the clan remained from earlier days. O'Hart also notes the clans of Maolgeimridh (Mulgemery, or Montgomery) and of Maolpadraig or Kilpatrick, who possessed the two districts of Cineal Fereadaidh (or Faraday), in the east of Tyrone. Máel Íssu m. Máel Brigti m. Duib Indsi m. Máel Pátric m. Doiligén m. Brolcháin m. Eilgíne m. Díchon m. Flaind m. Máel Tuile m. Crundmáel m. Suibne m. Fiachnai m. Feradaich m. Éogain m. Néill Noígiallaig. For 626, The battle of Leathairbhe between Maelfithrigh, chief of Cinel Mic Earca, and Ernaine, son of Fiachna, chief of Cinel Fearadhaigh, where Maelfithrigh, son of Aedh Uairidhnach, was slain. For 631, Ernaine, son of Fiachna, chief of Cinel Fearadhaigh, was slain. It was by him Maelfithrigh, son of Aedh Uairidhnach, was slain in the battle of Letherbhe. For 1082, Uidhrin Ua Maoil Muire, taoisech Cenél Fearadhaigh, died. For 1120, Echmharcach mac Uidhrin taoiseac Chenél Fearadhaigh, do mharbhadh d'Feraibh Manach. For 1129, Giolla Chriost h-Ua h-Uidhrín, toiseach Cenél Fearadhaigh, do losccadh i t-tigh a altrann i t-Tír Manach i meabhail. For 1166, Mac Gille Martain, toiseach Cenél Fearadhaigh. For 1185, Gilchreest Mac Cawell, Chief of Kinel-Farry and of the Clans, viz. Clann-Aengus, Clann-Duibhinreacht, Clann-Fogarty, Hy-Kennoda, and Clann-Colla in Fermanagh, and who was the chief adviser of all the north of Ireland, was slain by O'Hegny and Muintir-Keevan, who carried away his head, which, however, was recovered from them in a month afterwards. For 1215, Murrough Mac Cawell, Chief of Kinel-Farry, died. For 1238, Flaherty Mac Cawell, Chief of Kinel-Farry, and Clann-Congail, and of Hy-Kennoda in Fermanagh, the most illustrious in Tyrone for feats of arms and hospitality, was treacherously slain by Donough Mac Cawell, his own kinsman. For 1251, Donough Mac Cawell, Chief of Kinel-Farry, was slain by the men of Oriel. For 1252, Conor Mac Cawell, Chief of Kinel-Farry in Tyrone, and many other territories, and peace-maker of Tirconnell, Tyrone, and Oriel, was slain by the people of Brian O'Neill, while defending his protegees against them, he himself being under the protection of O'Gormly and O'Kane. For 1262, Donslevy Mac Cawell, Chief of Kinel-Farry, was slain by Hugh Boy O'Neill. For 1346, Cu-Uladh Mac Cawell, chief of Kinel-Farry, was slain by Donnell Mac Cawell. Cenel Tigernaich, of the Cenél Éoghain. Tigernach, son of Muiredach and grandson of Eoghan was the progenitor of this clan, although the Book of Ballymote cites a Cenél Tigearnaigh as the race of Tigearnach, son of Eoghan, son of Niall. O'Mulfoharty, and O'Heodhasa (O'Hosey), were styled chiefs of Cineal Tighearnaigh in co. Tyrone according to O'Hart (Pedigrees). O'Hart's source was O'Dugan (Poems) who cites O'Maoilfothartaigh, over Cinel Tighearnaigh; and O hEodhosa, and O hOgain. Áed mc Muiredaich m. Donngusa m. Duib Uinsenn m. Ainbítha m. Máel Éoain m. Fogartaich m. Máel Roit m. Fir Móir m. Muirgiusa m. Cobthaich m. Tnúthgaile m. Dáire m. Sáráin m. Tigernaich m. Muiredaich m. Éogain m. Néill Noígiallaig. Cenel Mic Earca, of the Cenél Éoghain. A grandson of Eoghan was Muircherdaich, sovereign of Ireland from about 504 to 527, who was also called mac Earca (after his mother). The Cenel Mic Earca produced a line of kings who were styled sovereigns of Ireland. Máel Fithrich, the son of Aedh Uairidhnach was styled as chief of Cenel mac Earca, and some (Hogan) have placed them in the vicinity of the barony of Clogher, co. Tyrone, as a result of Máel Fithrich's death at the hands of the Cinel Fearadhaigh. Note: Another Cenel Mic Earca has been placed, in the Book of Ballymote and elsewhere, in connection with Tír Ceara in Ui Fiachrach, co. Mayo. Máel Fithrich m. Áeda Uaridnaich m. Domnaill m. Muircherdaich m. Muiredaich m. Éogain m. Néill. For 478, After Oilioll Molt, son of Dathi, son of Fiachra, had been twenty years in the sovereignty of Ireland, he was slain in the battle of Ocha, by Lughaidh, son of Laeghaire, and Muircheartach Mac Earca, among other nobles. For 486, Uel hoc anno primum bellum Graine in quo Muircheartach mc. Earca uichtor erat. For 489, Aenghus, son of Nadfraech, King of Munster, fell in the battle of Cell Osnadha fought against him by Muircheartach Mac Earca, among others. For 497, The battle of Inde Mor, in Crioch Ua nGabhla, was gained over the Leinstermen and Illann, son of Dunlaing, by Muircheartach mac Earca. For 499/502, The battle of Seaghais was fought by Muircheartach mac Earca against Duach Teangumha, King of Connaught. For 504, The first year of Muircheartach, son of Muireadhach, son of Eoghan, son of Niall, as king over Ireland. For 513, The battle of Dedna, in Droma Breagh, by Muircheartach mac Earca, and by Colga, son of Loite, son of Crunn, son of Feidhlimidh, son of Colla Dachrich, chief of Airghialla, where Ardghal, son of Conall Creamhthainne, son of Niall, was slain. For 524, The battle of Ath Sighe was gained by Muircheartach against the Leinstermen. where Sighe, the son of Dian, was slain, from who Ath Sighe is called. For 526, The battle of Eibhlinne by Muircheartach mac Earca. For 527, After Muircheartach, son of Muireadhach, son of Eoghan, son of Niall of the Nine Hostages, had been twenty four years in the sovereignty of Ireland, he was burned in the house of Cleiteach, over the Boyne, on the night of Samhain the first of November, after being drowned in wine. He was killed by Sin, daughter of Sighe, in revenge of her father. For 537/47, The battle of Sligeach by Fearghus and Domhnall, the two sons of Muircheartach mac Earca; by Ainmire, son of Sedna; and Ainnidh, son of Duach, against Eoghan Bel, King of Connaught. They routed the forces before them, and Eoghan Bel was slain. For 544, The battle of Cuil Conaire, in Ceara, was fought by Fearghus and Domhnall, two sons of Muircheartach mac Earca, against Ailill Inbhanda, King of Connaught, and Aedh Fortamhail; and Ailill and Aedh were slain. For 555, The battle of Cul Dreimhne was gained against Diarmaid, son of Cearbhall (sovereign of Ireland), by Fearghus and Domhnall, the two sons of Muircheartach, son of Earca, among others. For 557, The battle of Moin Doire Lothair was gained over the Cruithnigh, by the Ui Neill of the North, i. e. by the Cinel Conaill and Cinel Eoghain, wherein fell seven chieftains of the Cruithnigh, together with Aedh Breac; and it was on this occasion that the Lee and Carn Eolairg were forfeited to the Clanna Neill of the North. The two sons of Mac Earca were in this battle. For 559, The first year of the two sons of Muircheartach, son of Muireadhach, in the kingdom of Ireland, i.e. Domhnall and Fearghus. The battle of Gabhra Liffe, and the battle of Dumha Aichir, by Domhnall and Fearghus, against the Leinstermen. For 562, The first year of Eochaidh, son of Domhnall, son of Muircheartach; and of Baedan, son of Muircheartach, son of Muireadhach, in the sovereignty of Ireland. For 563, After Eochaidh and Baedan had been two years in the sovereignty of Ireland, they were slain by Cronan, chief of Cianachta Glinne Gemhin. For 579, The battle of Druim Mic Earca, was gained by Aedh, son of Ainmire, over the Cinel Eogain, where was slain Colga, son of Domhnall, son of Muircheartach, son of Muireadhach. For 600/04, After Colman Rimidh, son of Baedan Brighi, son of Muircheartach, son of Muireadhach, son of Eoghan, son of Niall, had been six years in the sovereignty of Ireland, along with Aedh Slaine, son of Diarmaid, of the Southern Ui Neill, they both were slain. Colman Rimidh was slain by Lochan Dilmana. For 607, After Aedh Uairidhnach had been seven years in the sovereignty of Ireland, he died at Ath Da Fearta. For 626, The battle of Leathairbhe between Maelfithrigh, chief of Cinel Mic Earca, and Ernaine, son of Fiachra, chief of Cinel Fearadhaigh, where Maelfithrigh, son of Aedh Uairidhnach, was slain. For 769, Badhbhchadh, son of Eachtghus, chief of Cinel Mic Earca, died. For 792, Muireadhach, son of Flann Garadh, lord of Cinel Mic Earca, died. For 828, Finneachta, son of Bodhbhchadh, lord of Cinel-Mic-Erca, died. Fir Maige Itha - the men of Magh Ithe, a plain located in the baronies of Raphoe in modern county Donegal, which belonged early to the Cenel Eoghain. Various septs are mentioned in the area, according to the Annals, and in the 12th century this included Ua Gailmredhaigh of Cenél Moain and O'Cairellan of Clann Diarmada (both of Cenél Éoghain). The Ua Gailmredhaigh were expelled from Donegal, by the Cenél Conaill, in the 13th century, and afterwards settled on the opposite side of Lough Foyle, between Strabane and Derry. Note: Not to be confused with Magh Itha in Leinster, where the Book of Lecan notes Fir Maigi Itha have 7 Aicme [tribes], viz., Ui Deaga, Ui Setna, Ui Dimai, Ui Eircc, Ui Chormaic, Ui Niath and Ui Duirrtheacht. M727/U733, A battle was fought between Aedh, son of Fearghal, and the Cinel Conaill, at Magh Itha, where Conaing, son of Congal, son of Fearghus, and many others of the Cinel Eoghain, were slain. M728, A battle was fought in Magh Itha, between the sons of Loingseach, son of Aenghus, and the sons of Fearghal, son of Maelduin, where numbers of the Cinel Eoghain were slain. U734, An encounter in Mag Itha between Flaithbertach son of Loingsech and Fergal's son - Aed Allán - in which the Uí Echdach of Cenél Eógain and others fell. M812, Gormghal, lord of Magh Itha, died. M843, A battle was gained over the foreigners by the king, Niall, son of Aedh, in Magh Itha; and a countless number fell. M957, A plundering army was led to Inis-Eanaigh by Fearghal Ua Ruairc; and the battle of Magh-Itha was gained, wherein Aedh, son of Flaithbheartach, heir apparent of Cinel-Eoghain, was slain. M993, Aedh, son of Dubhghall, son of Donnchadh, lord of Magh-Ithe, and royal heir of Oileach, died. U1011, Mael Ruanaid ua Domnaill, king of Cenél Lugdach, was killed by the Fir Maige Itha, [and] Aengus ua Lapáin i.e. king of Cenél Énna, by the Cenél Eógain of Inis [Eógain]. LC1016, Coscrach, son of Muiredhach, son of Flann, king of Feara-Maighe-Itha, [killed by his own people]. M1023, Lochlainn, son of Maeleachlainn, lord of Inis-Eoghain and Magh-Itha, was slain by his own brother, Niall, and the Cianachta of Gleann-Geimhin. U1050, A skirmish between the Fir Maige Itha and the Airgialla, in which Eochaid ua hOiséni fell. LC1076, The victory of Belat was gained by Aedh Ua Maelsechlainn, and by the men of Magh-Itha, over the Cianachta, who were put to slaughter. U1128, The men of Magh Itha, i.e. Domnall ua Gailmredhaigh, and the Cenél Moain stormed a house against the king of Fir Manach, i.e. Faelán ua Duibdara. LC1135, Ruaidhri O'Canannain, king of Cenel-Conaill, a war-like, defensive man, of charity and humanity, was slain by the men of Magh-Itha, viz., by Maelruanaidh O'Cairellan, and by Clann-Diarmada. M1135, Ruaidhri Ua Canannain, lord of Cinel-Conaill, warlike and defensive pillar of charity and humanity, was slain by the men of Magh-Itha, namely, by Maelruanaidh Ua Caireallain and the Clann-Diarmada, after which a great slaughter was made of the Cinel-Eoghain by the Cinel-Conaill. M1136, Conchobhar, son of Domhnall Ua Lochlainn, who was first lord of Aileach, and king of all the north, both Cinel-Conaill and Cinel-Eoghain, Ulidians and Airghialla, and also royal heir of Ireland, was killed by the men of Magh-Itha, by treachery. U1177, Niall Ua Gailmredhaigh, king of the Men of Magh-Itha and of Cenel-Ennai, was killed by Donnchadh Ua Cairella[i]n and by the Clan-Diarmata, in the centre of Daire of Colum-cille. U1178, Conchobur, son of Conallach Ua Luinigh, took the chieftaincy of Cenel-Maien and Domnall, son of Domnall Ua Gailmredhaigh, was expelled from Magh-Itha into Inis-Eogain, to Donnchadh Ua Duibdirma. The Cenel-Maien, however, in the same year, namely, before the end of one quarter, deposed the son of Conallach and gave the chieftaincy to Domnall, son of Domnall. M1198, Hugh O'Neill and the Kinel-Owen made a second incursion into the plain of Moy Itha, to give battle to the Kinel-Connell; but the Kinel-Connell left their camp to them, upon which terms of peace and friendship were agreed on between the parties. U1199, Great war between [Cenel-]Cona[i]ll and [Cenel-]Eoga[i]n, so that Cenel-Conaill gave the king ship to Ua Eicnigh. Then he came to meet them to the Termonn of [St.] Dabeoc. Ua Neill with the Men of Magh-Itha came against him, to prevent him, so that each of them saw the other. And Ua Eicnigh was defeated and left pledges. From here Aedh Ua Neill and the Cenel-Eogain [went] on the same day, until they harried Cenel-Conaill around the Plain of Magh-Itha and took countless cattle-spoil away with them. And it is on that foray Niall Ua Duibhdirma was killed on a surprise party. After that, a hosting [was made] by Aedh Ua Neill and by the Cenel-Eogain to the Plain of Magh-Itha, to give battle to the Cenel-Conaill, so that the Cenel-Conaill abandoned the camp and they made a kind of peace then. Clan Conchobhair, of the Cenél Éoghain, said to be originally of Magh Ithe and certain septs moving into county Derry about the 10th-11th century. Conchobhar was the son of Fergal, and the great-great grandson of Aedh Uairidhnach, whose descendants included O'Cathain (O'Kane and O'Cane), O'Mullan, MacCloskey and the Clan Diarmatta. The O'Kanes were lords of Creeve (Coleraine area) and Keenaght beginning about the 12th century when they overshadowed the O'Connors of Glengiven (modern Dungiven), and Fir na Craoibhe. Máel Ruanaid m. Áeda m. Ruaidrí m. Óengusa m. Cairelláin m. Baígill m. Diarmata m. Conchobuir m. Fergaile m. Máele Dúin m. Máel Fithrich m. Áeda Uaridnaich m. Domnaill m. Muircherdaich m. Muiredaich m. Éogain m. Néill Noígiallaig. Ciannachta of Glenn Geimin, of Clann Cian, the O Conchubhair Ciannachta occupied the area of Glinne Gemin (Glengiven, barony of Keenaght, County Derry) with authority from about the 5th century, and were succeeded by the O'Cathains in the 12th century. For more information on the lineage of the Ciannachta, also see Ciannachta Breagh. Conchobor m. Donnchada m. Galaich m. Diarmata m. Conchobuir m. Duind Chuain m. Condálaich m. Máel Fathardaig m. Conchobuir m. Taidg Temin m. Cind Fáelad m. Suibne m. Faílbe m. Ernáine m. Crachíne m. Cormaic m. Eircc m. Etchon m. Findcháin (is é cétnandgab Glenn Gaimen) m. Féicc m. Imchada m. Condlai m. Taidgg m. Céin m. Ailella Auluimb. M563, After Eochaidh and Baedan had been two years in the sovereignty of Ireland, they were slain by Cronan, chief of Cianachta Glinne Gemhin. U572, The slaying of two descendants of Muiredach i.e. Baetán son of Muirchertach and Echaid son of Domnall son of Muirchertach Mac Erca, in the third year of their reign. Crónán son of Tigernach, king of the Ciannachta of Glenn Geimin, was their slayer. CS681, Cenn Faelad son of Suibne, king of the Ciannachta of Glenn Geimin, died. CS681, Mael Dúin son of Mael Fithrich was slain by the Ciannachta of Glenn Geimin and by Flann Finn son of Mael Tuile. M752, Tomaltach, Lord of Cianachta Glinne Geimhin, died. M755, Conchobhar grandson of Tadhg Teimhin, Lord of Ciannachta Glinne Geimhin, died. U757, Fergus son of Congal, Tomaltach, king of Ciannachta Glinne Gaimin, the anchorite Cuidgal, Aildobur, abbot of Muiccert, died. M881, Donnchuan, son of Conghalach, lord of Cianachta Glinne Geimhin, died. M925, Goach, son of Dubhroa, lord of Cianachta-Glinne-Geimhin, was slain by Muircheartach, son of Niall. U1015, Donnchad ua Goaigh, king of Ciannachta, was killed by the Cenél Eógain. M1022, Domhnall, grandson of Murchadh Glunillar, lord of the North, was slain by the Cianachta of Gleann-Geimhin. LC1094, Conchobhar O'Conchobhair, king of Cianachta, in poenitentia mortuus est. M1095, Ua Conchobhair, lord of Cianachta-Glinne-Geimhin, was slain. LC1100, Echri Ua Maelmuire, king of Cianachta, was slain by Ua Conchobhair of Cianachta-Glinne -Geimhin. LC1104, Donnchadh Ua Conchobhair, King of Cianachta, was slain by his own people. M1121, Gilla-Easbuig Eoghain Ua hAinniarraidh, lord of Cianachta-Glinne-Geimhin, was killed by his brothers. U1197, A hosting by John De-Courcy with the Foreigners of Ulidia to Ess-craibhe, so that they built the castle of Cell-Santain [and] the cantred of Ciannachta was desolated by them. U1197, Mac Gilla-Eidich of the Ciannachta robbed the great altar of the great church of Daire of Columcille and took the four [five] best goblets that were in Ireland therefrom, including 'the gray son' and 'the son of light' and the goblet of Ua Maeldoraidh and 'the twisted goblet' and the goblet of Ua Dochartaich... And he was hanged (namely, at the Cross of the Executions) in reparation to Colum-cille, whose altar was profaned there. U1207, A hosting by Hugo De Lacy into Ciannachta, so that he burned the churches of all Ciannachta and seized cows to a countless number. Clan Diarmatta (Clandermot), of the Cenél Éoghain, descent from Clan Conchobhair. The parish of Clondermot in County Derry is said to derive its name from this clan territory. An O'Carolan sept (O Cairealláin) as well as a Mac Ettigan (Mac Eitigen) were cited as chiefs of Clan Diarmada prior to the 13th century. Note: not to be confused with Uí Diarmata of Síl Muiredaig, in Connacht. U1090, Mael Ruanaid ua Cairellán, chief of Clann Diarmata, Gilla Críst ua Luinig, chief of Cenél Maién, were treacherously killed on the same day by Domnall ua Lochlainn. LC1117, Conchobhar Ua Cairellain was slain by the Feara-Manach. CS1132, Diarmait grandson of Eitigén, chief of Clann Diarmata, dies. LC1135, 17] Ruaidhri O'Canannain, king of Cenel-Conaill, a war-like, defensive man, of charity and humanity, was slain by the men of Magh-Itha, viz., by Maelruanaidh O'Cairellan, and by Clann-Diarmada. LC1177, Conchobhar O'Cairellain, indeed, gained a victory over O'Maeldoraidh and the Cenel-Conaill, in which a great number of the Cenel-Enna were slain, along with the son of O'Serrigh, and many other chieftains likewise. LC1177, Conchobhar O'Cairellain, i.e. the chief of Clann-Diarmada, was slain ... by the forces of by John de Curci. LC1180, Raghnall O'Cairellain was slain by the Cenel-Moain. Donnchadh O'Cairellain was killed by the Cenel-Conaill. U1197, Ma[c] Craith Ua [F]laithbertaigh, son of the king of Tir Eogain, was killed and Maelruanaigh O Fercomais (or O'Cairellain), arch-chief of Clann-Diarmata, was killed and two good horsemen of his people were killed. U1207, A treacherous foray by the Cenel-Conaill into Ui-Fhearannain and into Clann-Diarmata, so that they seized cows and killed people. The Clann-Diarmata and the Ui-[Fh]airennain and the Ui-Gailmredhaigh overtook them, so that a countless number of them were slain and a multitude were drowned. M1215, Teige Mac Etigen, Chief of Clann-Dermot, died. U1216, Oenghus Ua Cairrellain, chief of Clann-Diarmata, was killed by his own kinsmen. Cenél Aenghusa, of the Cenél Éoghain. I find little no reference to this group other than a citation in the Annals, and a similar reference in the Book of Lecan. Note: Cenél Aenghusa or Oenghusa was also a tribe name for the Mac Cana (MacCanns) who were lords of Clanbrassil in co. Armagh; and also the Cenél Aenghusa who were kings of Leth Cathail in county Down; and the name was also applied to the Ui Allmhuráin (O'Halloran) of co. Galway; and the Magennies of co. Down; and for one of the strong tribes of Dál Riada in Scotland; and for others as well. U1095, Muirchertach ua Cairpre, chief of Cenél Aenghusa, and heir designate of Ailech, dies. LC1095, Muirchertach Ua Cairre, steward of Cenel-Aenghusa, and royal heir of Oilech, died. M1155, Amhlaeibh Mac Cana, lord of Cinel-Aenghusa, pillar of the chivalry and vigour of all Cinel-Eoghain, died, and was interred at Ard-Macha. M1167, that part of the country of the Cinel to the south of the mountain (was given to) to Aedh Ua Neill, for two other hostages, i.e. Ua Maelaedha, one of the Cinel-Aenghusa, and Ua hUrthuile, one of the Ui-Tuirtre Ua Neill's own foster-brothers. LC1186, Gillachrist Mac Cathmhail, king-chieftain of Cenel Feradhaigh and the Clanns, (viz. : Clann-Aenghusa, and Clann-Duibhinrecht, and Clann-Foghartaigh; and Uí-Cendfada and Clann-Colla, of the Feara-Manach), and head of counsel of the North of Erinn, was slain by O'hEighnigh and Muinter-Caemhain; and they carried off his head, which was obtained from them at the end of a month afterwards. Conall Gulban was the son of Niall who established his kingdom, among other places, in Mag Ithe in the valley of the Finn. His territory was co-extensive, more or less with the present baronies of Tir Hugh, Bannagh, Boylagh and Kilmacrenan. Conall's sons included Óengus Gunnat, Nath Í, Tigernach Duí, Énna Bóguine, Fergus Cennfota (or Taulán), and Eochu. Some of the clans or territories of the Cenél Conaill included those of Sil Lugdach (O'Donnell, O'Boyle, O'Doherty, ...) Cenel Bóguine, Tir Ainmireach & Tir Aedha (O'Cannon, O'Muldorey, O'Gallaghers, ...), and Cenel Duach, among others. Máel Ruanaid m. Muirchertaich m. Óengusa m. Máel Bresail m. Máel Doraid m. Óengusa m. h-Irchada m. Máel Bresail m. Flaithbertaich m. Loingsich m. Óengusa m. Domnaill m. Áeda m. Ainmerech m. Sétnai m. Fergusa Ceannfhoda m. Conaill Gulban m. Néill Noígiallaig. For 564, The first year of Ainmire, son of Sedna, son of Fearghus Ceannfhoda, in the sovereignty of Ireland. For 566, After Ainmire, son of Sedna, son of Fearghus Ceannfhoda, was three years in the sovereignty of Ireland, he was slain by Fearghus, son of Nellin. For 567, After Baedan, son of Ninnidh, son of Fearghus Ceannfhoda, had been one year in the sovereignty of Ireland, he was slain at Leim An Eich. For 586, Baedan, son of Níndedha, son? of Conall Gulban, king of Tara. For 594, After Aedh, son of Ainmire, son of Sedna, had been twenty seven years in the sovereignty of Ireland, he was slain by Bran Dubh, son of Eochaidh, in the battle of Dun Bolg, in Leinster, after Aedh had gone to exact the Borumha, and to avenge his son Comusgach upon them. Some nobles fell in this battle of Bealach Duin Bolg, together with Beg, son of Cuanach, Lord of Oirghialla. For 605, Seachnasach, son of Garbhan, chief of Cinel Boghaine, was slain by Domhnall, son of Aedh, son of Ainmire. For 608, The first year of Maelcobha, son of Aedh, son of Ainmire, in the sovereignty of Ireland. For 610, After Maelcobha, son of Aedh, son of Ainmire, had been three years in the sovereignty of Ireland, he was slain by Suibhne Meann, in the battle of Sliabh Toadh. For 624, The first year of Domhnall, son of Aedh, son of Ainmire, in the sovereignty of Ireland. For 639, After Domhnall, son of Aedh, son of Ainmire, had been sixteen years in the sovereignty of Ireland, he died at Ard Fothadh, in Tir Aedha, after the victory of penance, for he was a year in his mortal sickness; and he used to receive the body of Christ every Sunday. For 640, The first year of Conall Cael and Ceallach, two sons of Maelcobha, son of Aedh, son of Ainmire, over Ireland, in joint sovereignty. For 641, Maelbreasail and Maelanfaidh died; and Flann Enaigh was mortally wounded. These were of the Cinel Conaill Gulban. For 646, The battle of Dun Crimhthainn was gained by Conall and Ceallach, the two sons of Maelcobha, over Aenghus, son of Domhnall; and Aenghus was slain in this battle; and there was also slain in this same battle Cathasach, son of Domhnall Breac. For 656, After Conall and Ceallach, the two sons of Maelcobha, son of Aedh, son of Ainmire, had been seventeen years over Ireland, Conall was slain by Diarmaid, son of Aedh Slaine; and Ceallach died at Brugh Mic An Og. For 622, Conall and Colgu, two sons of Domhnall, son of Aedh, son of Ainmire, were slain by Ceirrceann. For 670, Dungal, son of Maeltuile, chief of Cinel Boghaine, was slain by Loingseach, son of Aenghus, chief of Cinel Conaill. For 694, The first year of Loingseach, son of Aenghus, in the sovereignty of Ireland. For 701, After Loingseach, son of Aenghus, son of Domhnall, had been eight years in the sovereignty of Ireland, he was slain in the battle of Corann, by Ceallach of Loch Cime, the son of Raghallach. There were slain also his three sons along with him, Artghal, Connachtach, and Flann Gearg. For 723, The first year of Flaithbheartach, son of Loingseach, son of Aenghus, in sovereignty over Ireland. For 728, Flaithbheartach sent for a marine fleet of Dal Riada to Ireland, and on their arrival they made no delay till they arrived in Inis hOinae; and there was a battle fought between Flaithbheartach with his guards and the Cianachta, and others of the Ulidians and the Cinel Eoghain; and a countless number of the Ulidians, Cinel Eoghain, and Cianachta, were cut off, together with Conchubhar, son of Loichene, and Branchu, son of Bran; and a countless number of them was drowned in the Banna, after their having been defeated. For 749, Loingseach, son of Flaithbheartach, lord of Cinel Conaill, died. For 762, Murchadh, son of Flaithbheartach, lord of Cinel Conaill, was slain. For 799, Domhnall, son of Aedh Muindearg, son of Flaithbheartach, son of Loingseach, son of Aenghus, son of Domhnall, son of Aedh, son of Ainmire, lord of the North, died. For 810, Colman, son of Niall, was slain by the Cinel Conaill. A hosting was made by Aedh Oirdnidhe against the Cinel Conaill, by which Roghallach, son of Flaithghius, was slain. For 817, A battle between the Cinel Conaill and Cinel Eoghain, in which Maelbreasail, son of Murchadh, lord of Cinel Conaill, was slain by Murchadh, son of Maelduin. For 868, Dalach, son of Muircheartach, lord of Cinel Conaill, was slain. For 874, The battle of Claideach, between the Cinel Eoghain and Cinel Conaill, in which Domhnall was routed. For 899, Fogartach, son of Maeldoraidh, lord of Cinel Conaill, fell upon his own javelin, and died of it the wound. For 901, Eigneachan, son of Dalach, son of Muircheartach, lord of Cinel Conaill, died. Cenél Aedha, of Cenél Conaill, a sept descended from Conall Gulban who are said to have given their name to the barony of Tirhugh, alias Tír Aedha, in county Donegal. In Irish tradition, the naming of Tír Aedha is also cited from Aodh Ruadh, aka Tír n-Aeda Ruaid mic Badhuirnn (mic Airgedmair), a legendary monarch of Ireland and father of Macha, founder of Emain. From the same name comes Eas Ruaidh (Assaroe, now Ballyshannon), an early name for this region of Donegal. Early prominent septs in the area of Tirhugh included Ó Maeldoraidh, Ó Canannáin (O'Cannon) and Ó Gallchobhair (O'Gallagher). The former two were in early contention for the kingship of Cenél Conaill, as noted in the Annals. By the 13th century the O'Donnells rose to dominance among the septs of Cenél Conaill, the O'Gallaghers becoming the leaders of the O'Donnell calvary. Gallchobar m. Ruarcain m. Ruaidri m. Donnchadha m. Domhnaill m. Ceallaigh m. Maoil cobha m. Aedha m. Ainmirech m. Setna m. Ferghusa cennfhoda m Conaill gulban m. Neill noighiallaigh. M896, Maelbreasail, son of Maeldoraidh, lord of Cinel Conaill, was slain in the battle of Sailtin, by Murchadh, son of Maelduin, lord of Cinel Eoghain. CS943/M941, A battle-rout was inflicted by Ua Canannáin, by Ruaidrí, on the Cenél nEógain with the foreigners of Loch Febail, in which many fell including Mael Ruanaid son of Flann, heir designate of the North. U947, Ruaidrí ua Canannáin led an army to Sláine, and the foreigners and Irish, i.e. Congalach son of Mael Mithig and Amlaíb Cuaráin, came upon him, and the foreigners of Áth Cliath were defeated, and many of them killed and drowned. U949, Ua Canannáin made a foray and plundered Fir Lí and killed Flaithbertach ua Néill. M949, Niall Mothlach Ua Canannain was slain by the Cairbri-Mora. AI950, Death of Ruaidrí Ua Canannáin, high-king of Cenél Conaill. U950, Ruaidrí ua Canannáin, i.e. heir designate of Ireland, was killed by the foreigners after he had beleaguered Mide and Brega for six months and had inflicted a slaughter on the foreigners, to the number of two thousand or more. Niall ua Canannáin and a few others were also slain in a counterattack. CS957/U957/M955, Mael Coluim ua Canannáin, king of Cenél Conaill, dies. M960, Aenghus Ua Maeldoraidh, lord of Cinel-Conaill, was slain by the Cinel-Conaill themselves. M962, Muircheartach Ua Canannain, lord of Cinel-Conaill, was killed by his own tribe. U967/M965, Mael Ísu ua Canannáin, king of Cenél Conaill, fell... by the Cenél Eógain. U977/M975, Gilla Coluim ua Canannáin was killed by Domnall ua Néill. M978, Tighearnan Ua Maeldoraidh, lord of Cinel-Conaill, was slain. CS979/U978, A battle-rout was inflicted by the Airgialla on the Cenél Conaill in which many fell, including Niall ua Canannáin and ua Congalaigh and the son of Murchadh Glún Ilair and others. M989, Aedh Ua Maeldoraidh, lord of Cinel-Conaill, died. CS997/M996, Ruaidrí son of Niall ua Canannáin, king of Cenél Conaill, dies. T1000/AI1003, Flaithbertach Ua Canannáin, king of Cenél Eógain and Cenél Conaill, was killed by his own people by treachery. Maelruanaidh ua Maeldoraidh, king of Cenél Conaill, went overseas on pilgrimage. M1010, An army was led by Brian to Magh-Corrann, and he took with him the lord of Cinel-Conaill, i.e. Maelruanaidh Ua Maeldoraidh, in obedience, to Ceann-Coradh. M1026, Maelruanaidh O'Maeldoraidh, lord of Cinel-Conaill, went over the sea on his pilgrimage. He died the next year. CS1029, Muirchertach ua Maíldoraidh, king of Cenél Conaill, was killed by the Uí Canannáin at Ráth Canannáin. CS1030, Ruaidrí ua Canannáin was killed at Modorn by Aed ua Néill. M1032/LC1032, Domhnall, son of Maelruanaidh Ua Maeldoraidh, lord of Cinel-Conaill, was slain by the Clann-Fianghusa. M1037, Three of the Ui-Maeldoraidh were slain by Ua Canannain. AI1045, Flaithbertach Ua Canannáin, king of Cenél Conaill, dies. M1061, Domhnall Ua Maeldoraidh was slain by Ruaidhri Ua Canannain in a battle. CS1071, Ruaidrí ua Canannáin, king of Cenél Conaill,was killed. LC1072, Ruaidhri O'Canannain, king of Cenel-Conaill, was slain by Ua Maeldoraidh, i.e. Aenghus. LC1075/CS1075, Donnchadh Ua Canannáin, king of Cenél Conaill, dies. U1083, Domnall ua Canannáin, king of Cenél Conaill, was killed by his own people. LC1093, Aedh Ua Canannain, king of Cenel-Conaill, was blinded by Domhnall Mac Lachlainn, king of Oilech. LC1103, Ua Canannain, i.e. the King of Cenel-Conaill, was expelled from his sovereignty by Domhnall Mac Lachlainn. LC1114, Ruaidhri Ua Canannain, royal heir of Cenel-Conaill, was slain by the Cenel-Eoghain. MCB1126, A great foray by Ruaidhrí Ó Canannáin, king of Cinéal Conaill, into Connacht after Toirdhealbhach. CS1135, Ruaidrí ua Canannáin, king of Cenél Conaill, was killed by the Cenél Eogain. M1153, Flaithbheartach Ua Canannain, lord of Cinel-Conaill, and his wife, Dubhchobhlaigh, daughter of Toirdhealbhach Ua Conchobhair, were drowned, with the crew of a ship of their people along with them, in the sea, opposite Cairbre of Druim-cliabh. M1154, Aedh, son of Ruaidhri Ua Canannain, assumed the lordship of Tir-Conaill. M1156, Aedh, son of Ruaidhri Ua Canannain, lord of Cinel-Conaill, was slain by Ua Cathain and Feara-na-Craeibhe, by treachery. M1160, Two of the Ui-Maeldoraidh were killed by the Aithchleireach Ua Canannain, lord of Cinel-Conaill, while under the protection of the laity and clergy of the Cinel-Conaill themselves.The Aithchleireach himself and two others of the Ui-Canannain were killed by the Cinel-Conaill, in revenge of their guarantee. M1165, Maghnus Ua Canannain, lord of Cinel-Conaill, died. LC1196, Flaithbhertach O'Maeldoraidh, king of Cenel-Conaill, and Cenel-Eoghain, and Airghiall, the defender of Temhair, and royal heir of all Erinn, died. 1248, Muiris Fitz Gerald marched into Tir Conaill. He raided and slew and plundered, and he banished O Canannain, who took refuge with the Cenel Eogain, and left the kingship of Cenel Conaill with Gofraid son of Domnall Mor O Domnaill. Sil Lugdach, of the Cenél Conaill and Clann Dálaigh. Lugaid was the son of Setna, and great-grandson of Conall Gulban, whose descendants included the sept of O'Domhnaill (O'Donnell), Kings of Tir Conaill from the 13th to the 17th centuries ("Flight of the Earls"). Sil Lugdach, or Cenél Luighdech, is described as a chief sept seated in the barony of Kilmacrenan, county Donegal (Book of Fenagh), their tribal territory extended from Dobhar (Gweedore) to the river Suilidhe (Swilly) (Leabhar na gCeart). The O'Donnells, at first lived along the river Lennon but later established themselves in south Donegal. They rose to power as kings of Cenél Conaill in the early 13th century. The Uí Baoighill (O'Boyles) and the Uí Dochartaig (O'Dohertys) were also of Sil Lugdach. Cathbarr m. Gillai Críst m. Cathbairr m. Domnaill m. Éicnich m. Dálaich m. Muirchertaich m. Cind Fáelad m. Airnelaich m. Máel Dúin m. Cind Fáelad m. Gairb m. Rónáin m. Lugdach m. Sétnai mic Fergus m. Conaill Gulban m. Néill Noígiallaig. For 868, Maelmordha, son of Ailell, lord of Cinel Lughdhach, died. LC1038, Gillachrist, son of Cathbharr Ua Domhnaill, the prop of battle and defence of the Cenel-Conaill, was slain by the son of Conn Ua Domhnaill. U1100, The grandson of Gilla Coluim ua Domnaill, king of Cenél Lugdach, was killed by his own people. M1106, Cathbharr O'Domhnaill, pillar of the defence and warfare, of the glory and hospitality, of the Cinel-Luigdheach, died, after having gained the victory over the world and the devil. M1129, The house of Colum-Cille at Cill-mic-Nenain was forcibly taken, by Ua Tairchert, from Aedh, son of Cathbharr Ua Domhnaill, and it was burned over him. LC1207, A depredation was commited by Eignechán O'Domhnaill in Feara-Manach; but the Feara-Manach, in greater force than they were, overtook them, and O'Domhnaill, king of Tír-Conaill, till then the tower of valour, and honour, and strength of the North of Erinn, was slain there. MCB1209, A battle between Cinéal Eóghain and Cinéal Conaill near Fathan Mura, in which Cathbharr Ó Domhnaill, king of Cinéal Conaill, together with many of the Cinéal Conaill, was killed. C1231, Domnall O Domnaill king of Tir Conaill and Aengus Mac Gilla Finnein raised an army against Cathal O Raigillig. U1241, Domnall Mor Ua Domnaill, king of Tir-Conaill and Fir-Manach and Cairpri and Airghialla from the Plain downwards, died on the pillow, after bringing victory from the world and from the demon and he was buried in the Monastery of Es-ruadh. C1241, Maelsechlainn the son of O Domnaill was made king in succession to his father. O Neill (Brian, banished by Mac Lochlainn) came to him and together they marched back into Cenel Eogain, where Domnall Mac Lochlainn gave them battle - the battle of Camergi. Here Domnall Mac Lochlainn, king of Cenel nEogain, was slain, with ten of his close kindred. All the chieftains of Cenel nEogain were slain here and the kingship seized by Brian O Neill. C1246, Muiris Mac Gerailt made a great raid into Tir Conaill and gave half of it to Cormac son of Diarmait son of Ruaidri [O Conchobair]. He took hostages of O Domnaill for the other half and left them in the castle of Sligo. O Domnaill came on the first day of November with the chief men of Tir Conaill to Sligo and they burned the bawn of the town but could not prevail against the castle. The garrison hanged their hostages on the roof before their eyes. C1248, Muiris Fitz Gerald marched into Tir Conaill. He raided and slew and plundered, and he banished O Canannain, who took refuge with the Cenel Eogain, and left the kingship of Cenel Conaill with Gofraid son of Domnall Mor O Domnaill. C1248, The Cenel Eogain and O Canannain marched into Tir Conaill again. The Cenel Conaill gave battle to them and O Canannain with many noble persons besides was slain by the Cenel Conaill and Gofraid son of Domnall Mor O Domnaill, who took the kingship of Tir Conaill. C1258, Gofraid O Domnaill, king of Tir Conaill, died. Domnall O Domnaill was made king in his stead, and all the Cenel Conaill gave hostages and allegiance to him. C1290, Aed O Domnaill was deposed by his own brother Toirrdelbach, who assumed the kingship himself through the power of his mother's kin, the Clann Domnaill, and of many other Gallowglasses. C1333, Aed O Domnaill, king of Tir Conaill and Fermanagh, who had taken the hostages of both districts of Carbury and of Brefne and would have made a good king of the whole province of Ulster, the support of all Ireland by his bounty, bravery, discipline and rule, the greatest slayer of Galls and Gaels who were his contemporaries, died after a victory over the world and the Devil, having been king of Tir Conaill for fifty-two years. Arda Midhair, The Ó Dochartaigh (O'Dohertys), of Cenél Conaill, were cited as chiefs of Arda Midhair (Ardmire, perhaps the Finn Valley) in the barony of Raphoe, county Donegal. At the turn of the 13th century two Ó Dochartaigh were noted as kings of Tír Chonaill, breaking a long hold the O'Cannons and O'Muldorys (Mulderrys) had on this title. Soon after the O'Donnells rose to prominence in Tír Chonaill. By 1247 the O'Donnells are noted as Lords of Inishowen for the first time (Annals), an apparent indication of Cenel Conaill expansion into a region traditionally held region by the Cenel Eoghain (Mac Lochlainn). The arrival of the Norman de Burgo family by the latter half of the 13th century saw the building of fortifications in the region. Any fear of further Anglo-Norman expansion in Inishowen and Derry, however, was halted by the murder of Earl William de Burgh in 1333, and the absenteeism of his heirs kept the path open for Gaelic dominance in the region. It was perhaps during this time the Ó Dochartaigh began to make inroads into Inishowen, as chieftains under O'Donnell. By the early 15th century the Ó Dochartaighs are noted as lords of Inishowen (Annals), and the peninsula later became known as "O'Dogherty's Country". Diarmada m Conchobhair m Domhnaill finn m Donnchadha duinn m Domhnaill droma fornochta m Maenghuile m Donnchadha m Moenghuile m Dochartaigh (o raiter .h. Dochartaigh) m Maenghuile m Fiamhain m Cinnfaeladh m Gairbh m Ronain m Luigdheach m Setna m Ferghusa cennfhoda m Conaill gulban. LC1188, Ruaidhri O'Canannáin, king of Cenel-Conaill for a time, and also royal heir of Erinn, was slain by Flaithbhertach O'Maeldoraidh, through treachery, at the bridge of Sligech, i.e. after being enticed out from the middle of Druim-cliabh; and a brother of his was slain along with him, and a number of his people. O'Gairbh (namely, Maghnus), chieftain of Feara-Droma, it was that laid (violent) hands on O'Canannáin; and he was himself slain by the people of Echmarcach O'Dochartaigh, in revenge of O'Canannáin. LC1195, The Gilla-sron-mhael O'Dochartaigh, and the Cenel-Conaill likewise, turned against O'Maeldoraidh. MCB1197, A battle between John de Courcy and Cinéal Conaill at Cnoc na Sgam, in which slaughter was inflicted on them, and Eachmharcach Ó Dochartaigh, their king, was killed. LC1199, Domhnall O'Dochartaigh, king of Cenel-Enna and Ard-Midhair, in pace quievit. LC1202, Domhnall Carrach O'Dochartaigh, king-chieftain of Ard-Midhair, was slain by Muinter-Buighill, after plundering many churches and territories. U1203, Domnall Carrach Ua Dochartaigh, king of Tir-Conaill was killed by Muinnter-Baighill after pillaging many churches and territories. U1252, Conchobur Ua Dochartaigh, chief of Ard-midhair for a time, died. U1288, Aindiles O'Dochartaigh, chief of Ard-Midhair, rested in Christ. U1339, Domnall Ua Dochartaigh, arch-chief of Ard-Midhair -and it is not this alone, for there was little wanting from his having the lordship of Inis-Eogain and the lordship of the Cantred of Tir-hEnna and there was scarcely in Ireland a chief that had more people and a larger horse-host and better spirit and valour, hospitality and bestowal than he - and he died in the centre of his own house and John Ua Dochartaigh took his place. U1356/LC1359, John O'Dochartaigh, chieftain of Ard-Midhair, was taken prisoner. LC1413, Conchobhar O'Dochartaigh, i.e. chieftain of Ard-Midhair, and lord of Inis-Eoghain, and a man of universal bounty, died this year. Cenél mBógaine, of the Cenél Conaill, named from Énna Bóguine, son of Conall Gulban. O'Donovan describes Tír Boghaine as the barony of Banagh, and part of the barony of Boylagh, in county Donegal. St. Crona (Croine Bheag) who was living in the 7th century was the daughter of Diarmuid, son of Garbhan, son of Brandubh, son of Melge, son of Enna Boghuine, son of Conall Gulban, Son of Niall Naoighiallaigh (Niall of the Nine Hostages). Murchad m. Máel Ograi m. Echdach m. Forbassaich m. Sechnassaich m. Dúngalaich m. Máel Tuili m. Sechnassaich m. Garbáin m. Branduib m. Meilge m. Énnae Bóguine m. Conaill Gulban m. Néill Noígiallaig. M605/T609, Seachnasach, son of Garbhan, chief of Cinel Boghaine, was slain by Domhnall, son of Aedh, son of Ainmire. T626, Fiacha Fínd, rí Cenéoil Boghuine, died. M670, Dungal, son of Maeltuile, chief of Cinel Boghaine, was slain by Loingseach, son of Aenghus, chief of Cinel Conaill. CS722/M718, Forbasach king of Cenél Bógaine, e of Cenél Conaill, fell in battle. M781, Forbhasach, son of Seachnasach, chief of Cinel Boghaine, died. U784, A battle won by Donnchad son of Aed Muinderg over the Cenél Bogaine. U786, Death of Forbasach son of Sechnusach, king of Cenél Bógaine. U847/M845, Mael Goán son of Echaid, king of Cenél Bógaine, died. U1035, Flaithbertach ua Murchada, king of Cenél Bógaine, was killed with many others. U1496, Mac Suibne of Tir-Bagaine, namely, Mael-Muire, died this year. Cenel Duach, of the Cenél Conaill, named from Tigernach Duí (Duach), son of Conall Gulban. Nainnid son of Daui is mentioned in Chronicon Scotorum 563 at the battle of Móin Daire Lothair which was won over the Cruithin by the Uí Néill of the North. Chronicon Scotorum, in the year 586, notes the killing of Baetán son of Ninnid son of Daui son of Conall Gulban, king of Temair. The Annals of Tigernach cite Baedan, son of Níndedha, grandson of Conall Gulban, as a king of Tara in AD 586, i.e. Baedan mac Níndedha, maic Conaill Gulban, rí Temrach. In the Annals of Ulster, for 586, his obituary appears as "the killing of Baetán son of Ninnid son of Daui alias son of Fergus Cennfhata son of Conall of Gulbu, king of Temair, who reigned one year." Nuadu m. Duinechda m. Cuircc m. Duach m. Sechnassaich m. Conaill m. Báetáin m. Ninnida m. Duach m. Conaill Gulban m. Néill Noígiallaig. Tir Ainmireach, a name applied to an area of Ua Bhaeighill (O'Boyle) chieftainship in southern county Donegal. O'Hart (Pedigrees) calls the O'Boyles chiefs of Clan Chindfaoladh of Tir Ainmireach, and of Tir Boghaine. Originally their territory extended from Donegal town to near Kilmacreannan along the west coast. The O'Boyles are said to have given their name to the barony of Boylagh in county Donegal. With the rise of the O'Donnells in the 13th century, their territory became divided, with Tir Ainmireach (around Ardara) in the south, and the Three Tuatha (around Falcarragh and Kilmacrennan) toward the north. The MacSweeneys were brought into this area as Gallowglass to O'Donnell in the 14th century. LC1131, Garbhanach Ua Baeighill, was slain. U1160, Ua Canannain, king of Cenel-Conaill, was killed by the Cenel-Conaill themselves, namely, a house was burned by Ua Baighill upon him. LC1192, Eochaidh O'Baeighill was slain by the Uí-Fiachrach of Ard-sratha. U1223, Tadhg O'Baighill (namely, son of Ceallach), splendour of the North of Ireland, died. U1232, A hosting by Domnall Ua Lochlainn, [namely] by the king of Cenel-Eogain, along with the Foreigners and with the Gaidhil, into Tir-Conaill, whereby he destroyed much in Fanat and in Tir-Conaill and took away the hostages of Domnall Ua Baighill and of Ua Taircheirt with him. U1251, Gilla-Crist Ua Breslen, chief of Fanat and his kinsman were killed by Ceallach Ua Baighill the Dumb. U1259, Sigraidh O'Baighill was killed by his own kinsmen. U1278, Maelruanaigh O'Baighill, chief of 'the Three Territories', was killed. U1281, Dubghall, son of Maghnus Ua Baighill chief of Cloch-Cinnfhaelaidh, was killed by the people of Ua Mailgaithi. U1340, Aindiles O'Baighill, chief of Tir-hAinmirech and his son and Eogan, were killed in battle. M1360, Mulrony, son of the Cammhuinelach (the Wry-necked) O'Boyle, Chief of the three Tuathas, a man illustrious for his hospitality, nobleness, wisdom, conquests, and protection, died. Rosguill, a promontory (or Ross) in the barony of Kilmacrenan, co. Donegal, between Sheep Haven and Mulroy bay, i.e. in the parish of Mevagh. O'Dugan (Poems) cites that Ros-Guill and Ros-Iorguil belong to MacGillatsamhais. Ros-Iorguil, or Irguill, is equated to Horn Head, to the west of Ros Guill, in the index to the Four Masters. Both areas are west of Fanad. Who the MacGillatsamhais' (Mac Giolla Shamhais) were is not known. In the same section of his Topographical Poem, O'Dugan also mentions belong to O'Cearnachain (e.g. Kernaghan) and Muintir Dalachain over Tuath Bladhach (Bladhaigh). Tuath Bladhaigh, anglicized Tuath Doe, is a well known district situated between Sheep Head and Cloghaneely, placing it to the south of Ros-Iorguil. Cloghineely is noted by O'Donovan in connection with the Ua Baighill (O'Boyles) of Cloch Cinnfhaelaidh, where they held sway until perhaps the second half of the 14th century. Here they are cited as chiefs of na Trí Tuath before the MacSweeneys. The areas of Rosguill (now Downing's & Carrigart), Doe (now Creeslough & Dunfanaghy), Cloughaneely (now Falcarragh ) and Tory Island, were later ruled by the Mac Sweeneys from Doe Castle. These were the MacSweeney Na Doe (Mac Suibhne na d'Tuath), lords of Na Tuatha. The district called Na Trí Tuatha, or Tuatha Toraighe, was an area extending from Ros Guill and Mulroy Bay in the east to Gweedore Bay in the west, with Tory Island included. Note: Trí Tuatha, not to be confused with the Three Tuatha of county Roscommon. M718, Nuada, son of Eirc, chief of Gull and Irgull. CS722, Nuadu son of Orc (Orcdoith), king of Goll and Irgoll. M1130, Toirdhealbhach Ua Conchobhair proceeded with a fleet as far as Torach, and plundered Ros-Guill. C1281, Maelruanaid O Baigill, chieftain of the Three Tuatha. M1303, Niall, son of Niall O'Boyle, heir presumptive to the Three Tuathas, was slain. LC1515/U1515, Domhnall, son of Aedh Ruadh O'Domhnaill, was slain by Aedh Buidhe O'Domhnaill, in Tuath-Bladhaidh, in this year, and was carried dangerously wounded to the house of Mac Suibne of Fanat and died there, after Unction and after penance. U1540, Jacques, son of Conn Ua Domnaill, was slain by the sons of Murchadh Mac Suibne na Tuath this year. M1591, O'Rourke, i.e. Brian-na-Murtha, the son of Brian, son of Owen, was banished, as stated before, into the Tuatha in Tirconnell, where he remained upwards of a year with Mac Sweeny (Owen Oge). M1603, Hugh Boy, the son of Con, was wounded in the ankle; and he was sent to Crannog-na-nDuini in Ros-Guill, in the Tuathas, to be healed. Finn Ros, aka The Rosses, in Tirconnell, the land of the O Forananes and O Carnahanes, according to O'Brien's Irish Dictionary. O'Dugan (Poems) places O'Furadhrain over Fionn Ros, and O'Donovan translates the surname as Farran or Forran. O'Donovan in his notes to O'Dugan's Poems cites Fionn-Ros, now the Rosses, was situated in the barony of Boylagh. The Rosses are marked on a modern map of Ireland in the civil parish of Templecrone, in the far north of the barony of Boylagh. The Rosses extends from Crolly Bridge in the north to Gweebarra Bridge in the south, embracing all the intervening coastline and islands, penetrating inland as far as the Derryveagh mountains and the alpinesque village of Doochary. The territory of Trián Íochtair Baoighellach is described by O'Donovan (Four Masters) in "The Rosses", between Aranmore Island and the Gweedore river, in county Donegal. At least a portion of the Rosses region, if not all, was connected with the O'Boyles, near of a portion of the Tri Tuath area they once held. LC1342, Conchobhar O'Domhnaill; king of Tir-Conaill, and one worthy to rule all Erinn, if God had willed it, by reason of his nobility, eminence, and the excellence of his bounty and prowess, was slain by Niall O'Domhnaill, i.e. his own father's son: (the house of Finn-ros was burned over him, and O'Domhnaill went out of the house, and fell afterwards in the doorway of his own house), after obtaining victory over the devil and the world; and a great number of O'Domhnaill's household band were moreover burned and killed there. Niall O'Domhnaill was made king by a number of the chieftains of Tir-Conaill. Fánad, or Fanat, is the peninsula between Lough Swilly and Mulroy Bay, in the northeast of the barony of Kilmacrenan, county Donegal. The sept of Ua Bresleáin (O'Breslen or Breslin), a branch of the Cenél Enda (MacLysaght) although cited by others as a branch of Cenel Conaill, are noted as early chiefs of Fanad, later noted as Brehons for Maguire of Fermanagh. The Mac Suibhnes (Mac Sweeney Fanat) are not as chiefs of Fanad in the late 14th century. U1158, A hosting by Ua Lachlainn into Tir-Conaill also, so that he wasted Fanat entirely. M1186, Con O'Breslen, Chief of Fanad, the lamp of the hospitality and valour of the north of Ireland, was slain by the son of Mac Loughlin and a party of the Kinel-Owen; in consequence of which Inishowen was unjustly ravaged. M1213, Donn O'Breslen, Chief of Fanad, was treacherously killed by his own people. M1251, Gilchreest O'Breslen, Chief of Fanad, and his brother, were slain by Kellagh Balbh (the Stammering) O'Boyle. M1261, Sixteen of the most distinguished of the clergy of Kinel-Connell were killed at Derry by Conor O'Neill and the Kinel-Owen, together with Conor O'Firgil. Conor O'Neill was slain immediately afterwards by Donn O'Breslen, Chief of Fanad, through the miracles of God and St. Columbkille. M1263, Donn O'Breslen was slain by Donnell O'Donnell, in the bishop's court palace at Raphoe. M1281, Cormac, son of the Ferleighin Lector O'Donnell, Chief of Fanad, fell. LC1399, Toirdhelbhach, son of Maelmuire Mac Suibhne, lord of Fanad, quievit. Two distinct territories are mentioned. From Eanna (Enda), the sixth son of Conall Gulban, descended the Cinel Eanna, Kings of Magh Ith, Tir Eanna and Fanad in present day Co. Donegal. This territory was in and near the southern tip of Inishowen. (note: The cantred of Enda, son of Niall, is mentioned by the Four Masters in the year 1600). According to O'Dugan (Poems), the following were chiefs of Magh Ith: O'Baoighill, O'Maiolbreasail, O'Cuinn, and O'Cionaith. Mag Ith was partly in the barony of Raphoe in Donegal, and partly in the barony of Tirkeran in Derry. O'Breslin, cited as chiefs in Fanad and noted as brehons there, are cited by MacLysaght as a branch of Cenel Enda, and by others as a branch of Cenel Conaill (descent from Fergus Fanad). Another Cenél Endai was cited in southern Co. Donegal and possibly northwestern Co. Fermanagh. As the story goes, Enda, the youngest son of Niall of the Nine Hostages, received territory about the 5th century which extended from the river Errity to Barnesmore, barony of Tir Hugh, to Sruell in the barony of Banagh, county of Donegal. The north-western limit was Farnagh in the parish of Aughnis, barony of Kilmacrenan. The eastern limit of his lands was the river Finn. To confuse matters, there does not appear to be evidence of a dynastic family descended from Énda existing in the North before the 11th century. All earlier references in the Irish texts seem to associate the Cenél Énda with the Cenél Fiachach and the Lóegaire in Mide and also in Connacht. For example, Ua Braonain (O'Brennan) of Creeve and Mac Ruairc (Mag Rourke, Groarke) of Teallach-Conmasa, both located in county Westmeath, claim descent from a Cenél nÉnna. 11th century chiefs of Cenél n-Enda mentioned in the annals below include ua Lapáin (O'Lappin) and ua h-Eicnechan (roughly O'Heneghan). Chiefs from Cenél Moen and Cenél Conaill are later noted in the area of Tir Enda in co. Donegal. M1010, Oenghus Ua Lapáin, tigherna Cenél n-Enda was slain by the Cinel-Eoghain of the Island. LC1019, Flaithbhertach Ua Neill went into Tir-Conaill, and he destroyed Tir-Enna and Tir-Lughdech. M1036, Cú Ciche, mac Eccnecháin, tigherna Ceneoil Enda, died. M1057, Niall Ua hEgnechain, king of Cenel-Enna, rested. LC1078, Cathal, son of Domhnall, king of Cenel-Enna, was killed by the Cenel-Eoghain of the Island. M1175, The Kinel-Enda were defeated, and a great slaughter made of them by Eachmarcach O'Kane, and Niall O'Gormly. M1177, Niall O'Gormly, Lord of the men of Magh-Ithe and Kinel-Enda, was slain by Donough O'Carellan and the Clandermot in the middle of Derry Columbkille. M1177, O'Muldory and the Kinel-Connell were defeated by Conor O'Carellan in a battle, in which O'Sherry and many other distinguished men of the Kinel-Enda were slain. M1199, Donnell O'Doherty, Lord of Kinel-Enda and Ard-Mire (Ard-Midhair), died. M1201, On the same day the Kinel-Owen made another predatory incursion into Tirconnell; and a conflict took place between them and O'Donnell, in which the Kinel-Owen were defeated, and Gearrmaidi O'Boylan and many others of the Kinel-Owen were slain alone with him. M1342, Donnell O'Doherty, Chief of Ardmire, and of the cantred of Tir-Enda, a man full of hospitality and prowess, died, and John O'Doherty assumed his place. "Críoch Cairpre Droma Cliab" of northern Co. Sligo and northeast Co. Leitrim. The territory of Cairbre, son of Niall of the Nine Hostages, around the 6th century extended from the Drowes west to the Owenmore river in Ballysadare. Duncarbry (Dun Chairbre, or Cairbre's Fort) - later a McClancy fort - marks the border of Cairbre's territory on the Drowes, while the Barony of Carbury in North Sligo today reminds us also of where he ruled. Noted chiefs of Cenél Cairpre included O'Mulclohy (Ó Maolchloiche), a name which was later mistranslated to Stone. Cairbre's descendants are said to have also settled in Grandard in the county of Longford. Other Cairpre septs - Uí Cairpri Laigen (Ua Ciardha of Carbury, Co. Kildare); and Cairpre Gabra, near Grandard, co. Longford. h-Uallgarg m. Máel Ruanaid m. Máel Fábaill m. Ciardai m. Máel Bennachtai m. Écneicháin m. Dúnchada m. Arttgaile m. Donngaile m. Loingsich m. Lóegaire m. Con Gamna m. Moínaich m. Fiangusa m. Congaile m. Máel Dúin m. Scandláin m. Roitich m. Ainmerech m. Cormaicc m. Cairpri m. Néill Noígiallaig. Ua Ciardai as king of Cairpri around 954 (referring to the Cairpri Moir). For 1012, Ualgharg ua Ciarrdhai lá tigherna Coirpre. For 598, Colman, chief of Cinel Cairbre was victor at the battle of Eachros in Muirisc, against Maelcothaigh, chief of Cinel Fiachrach, of Muirisc. For 771, Cathal son of Conall Menn, king of Cairpre Mór, died (Sligo?). For 779, Cú Gamna, son of Naeinneanaigh, lord of Cinel Cairbre, died. Other Notes from O'Dugan, O'Hart, O'Donovan, etc. Muintir Devlin - Ó Doibhilin (O Devlin) near Ardboe, on the Tyrone shore of Lough Neagh. Muintir Ui Mailgaithi - U1281, Dubghall, son of Maghnus Ua Baighill chief of Cloch-Cinnfhaelaidh (Cloghineely), was killed by the people of Ua Mailgaithi (O Mailgaithe). Uí Macc Uais - The Uí Maic Caírthinnsouth of Lough Foyle, and the Uí Fiachrach Arda Sratha, and Uí Thuirtri west and east of the Sperrins were collectively known as the Uí Macc Uais. (see Arghialla).